2008: The Christian father of murdered Ipswich prostitute Tania Nicol has revealed why he had to forgive her killer. Tania was one of five girls murdered in Ipswich by convicted serial killer Steve Wright. 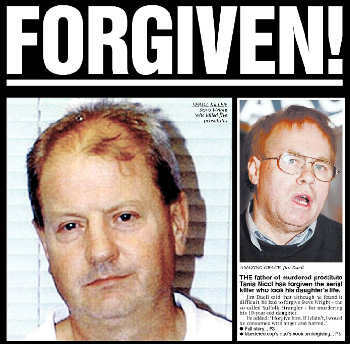 But brave father and born-again Christian Jim Duell declared that God had given him the grace to forgive the murderer. Jim, 60, used his faith to help him deal with the news that his daughter’s body had been found. “I’m a born-again Christian. I’d been assured that she was OK. I was worried about her soul,” he said. Mr Duell and Tania’s mum, Kerry Nicol, desperately tried to save the teenager from the peril of drugs that led her to prostitution and, ultimately, her murder. Neither knew until it was too late that their 19-year-old daughter was leading a secret life on the streets to fund an addiction to heroin. Mr Duell is still haunted by a memory of driving through Ipswich and, to his innocent delight, spotting Tania standing on a street corner. Mr Duell, who now lives alone after separating from Tania’s mother, painted a picture of a cheeky little girl growing up full of vitality and curiosity. At Chantry High School, Tania got a boyfriend. Mr Duell said: “Sea Cadets went out the window. She was 15 and he introduced her to cigarettes and then cannabis. Within a year or two, she was in the grip of hard drugs. “She had sores on her face but if you mentioned it she got upset. I walked into her bedroom and found some needles. She and I and her mother sat around the kitchen table to discuss it, but she insisted they belonged to a friend. Mr Duell said not a day passes without him thinking of his daughter. “We can’t get Tania back, but I know she is in a wonderful place now. As for the man who did this, if he doesn’t repent, if there’s a hell, where do you think he’s going?” he added. Pictured above is killer Steve Wright, left, and Tania Nicol's father Jim Duell, right.